Union home minister Sushilkumar Shinde on Wednesday called Aam Aadmi Party (AAP) leader Arvind Kejriwal a ‘mad chief minister’, saying he had to cancel the leave of several policemen because of Kejriwal, TV channels reported.Speaking at an event in Maharshtra, the home minister said, "When I was in Kherwadi (as a policeman), my leave was cancelled right after my wedding because there were riots. Now because of a 'veda mukhyamantri' (Marathi for 'mad chief minister') on dharna, I had to cancel the leaves of policemen". 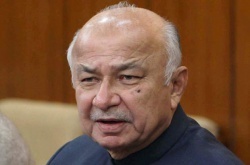 Shinde’s statement is the latest in slanging match between Kejriwal and Shinde.